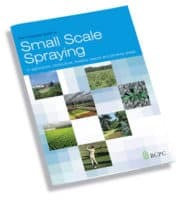 The industry’s best selling training manual for small-scale spraying Packed with practical tips and best practice advice including a handy protective equipment summary and nozzle selection chart this book has been extensively revised and updated in line with the revised Code of Practice for Plant Protection Products and the new Agricultural Waste Regulations. It details the decisions, equipment and background needs to all small-scale spraying operations. Practical guidance is provided on the use of lever-operated, compression and knapsack sprayers, mistblowers, CDA sprayers, wheeled sprayers and mounted and self-propelled equipment. Sections advise on the types of pumps used, sprayer design, control systems and filtration. Spray quality, nozzle codes and calibration are explained fully with worked examples to guide operators through the process. General advice on good spraying practice, sprayer decontamination and maintenance as well as disposal is also provided.